Excerpted from Public Space Amenities: A Guide to their Design and Management of in Downtowns, Neighborhood Commercial Districts, and Parks, published by Project for Public Spaces. 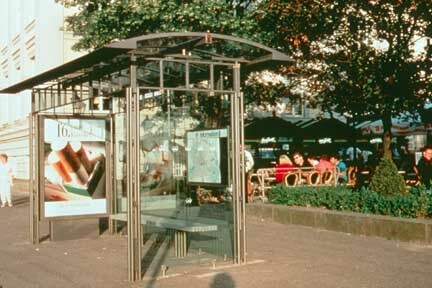 A good bus shelter is an essential part of any successful urban mass-transit system. What constitutes "good," however, depends upon your point of view. From the perspective of the city agency that is responsible for its management, a good shelter is one that has low maintenance requirements and is vandal-resistant. From the rider's point of view, an ideal shelter is one that allows visibility and easy access to the bus, is comfortable and convenient, provides clear information, and is safe. Both viewpoints are equally important to consider, because an unused shelter is a waste of money and an unnecessary maintenance problem. 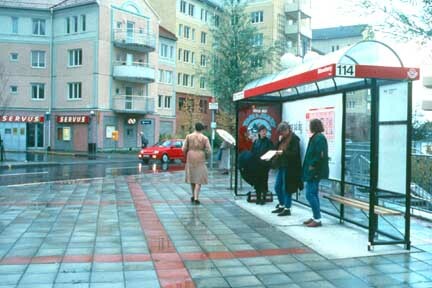 A well-designed, comfortable shelter can make waiting for a bus a pleasant -- and even interesting -- experience! Unfortunately, many poorly designed shelters also exist. To decide what type of shelter to use in a particular area requires an analysis of existing and anticipated conditions, as well as some knowledge of the characteristics of good shelter location and design. Information about each factor is included below. Is a bus shelter needed? How should it be maintained and managed? There are some general guidelines that should be followed in deciding whether or not a bus shelter is needed. 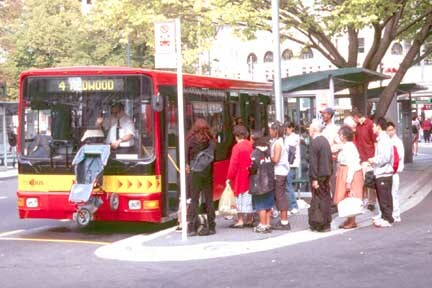 Situations where a shelter is required include the following: neighborhoods where buses run infrequently; commercial areas with frequent service and high levels of ridership; areas where security is a problem; neighborhoods where there are many older or infirmed people; and areas where inclement weather is common. 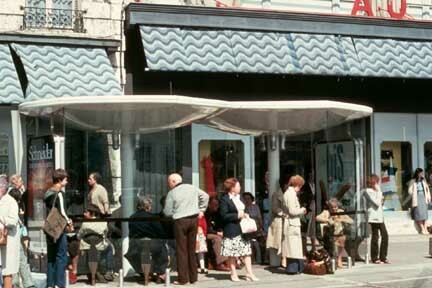 Good locations for bus shelters are near retail stores that have products related to bus riders' needs (e.g. bakery, flower shop, newsstand, etc.) and are open late at night; near office building entrances within view of a security guard; near street vendors; and in conjunction with other amenities such as telephones, benches, and so on. Bus shelters near intersections should be set back from the crosswalk approximately 10 feet to avoid conflicts with pedestrian traffic. 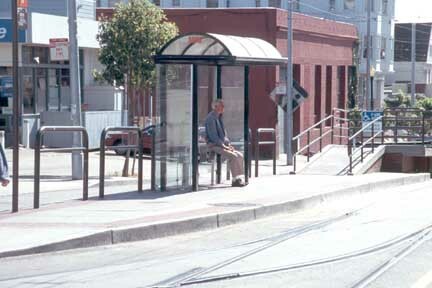 If a bus stop is on the far side of an intersection, the shelter should be located a minimum of 40 feet from the crosswalk to allow adequate room for the bus to stop. A distance of 3 feet should be allowed between the bus shelter and the curb for free movement in boarding and exiting from the bus. 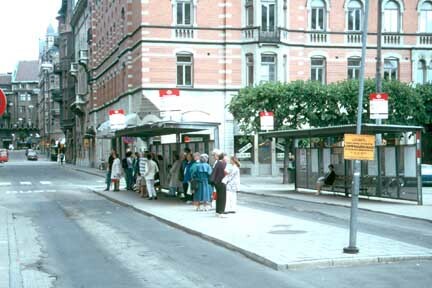 Bus shelters should have their long side parallel to the sidewalk to minimize interference with pedestrian traffic. Exit and entry openings should be oriented so that people are protected from the wind. However, it is important to keep the side of the shelter facing the street open to allow passengers to board or exit the bus easily. 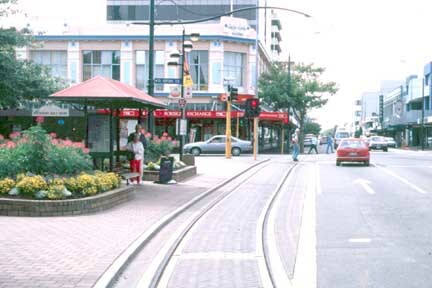 Elements such as information kiosks or vendors that can obstruct the view of oncoming buses should be located "down-stream" from the shelter. 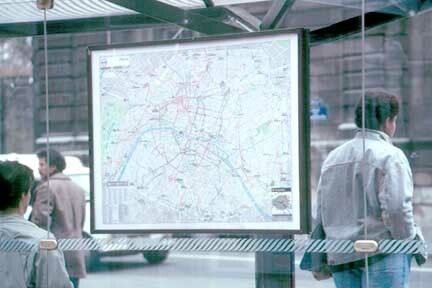 A bus shelter should be designed to reflect the city in which it is located. This can be accomplished through the use of local materials and by the design details. Often standard shelters can be adapted to reflect the unique characteristics of the area in which they are located. Within this context there are four general qualities that any well-designed bus shelter should have. These qualities, described below, are visibility, accessibility, comfort and convenience, and information. People must be able to see the bus coming. Poorly designed shelters that obstruct views of approaching buses will force people to leave the shelters to watch for oncoming buses. People must be able to board the bus conveniently. To many riders this is the most important aspect of a bus shelter's design, because people like to be close to the point where the bus door will open so they will be sure of getting on. The shelter should not obstruct this process of boarding. Shelters should provide a place to sit, protection from weather, and a feeling of safety and security. People need to know when a bus will arrive and where it will go. This is especially important for people who are unfamiliar with the service, such as tourists. Side panels should generally not be used on the curbside of the shelter, except on very narrow streets with heavy traffic. If side panels are used on the curbside, an opening at least 3 feet wide needs to be provided to allow people access to the buses. Side panels should be mounted 3 inches off the ground so that debris will not collect inside the shelter. If more than 3 inches off the ground, they will not keep out drafts. Side panels should be made of clear glass, as noted below. A pitched roof should be used to prevent the collection of rain, snow and debris. The amount of seating should be based on both the number of people who will use the shelter and the amount of time people will spend waiting. Where people wait for a long time, or where the shelter is used by the elderly or infirm, more scaling is generally needed than in areas where the bus comes more frequently. Leaning rails should be provided whenever possible. A wood rail at 3 feet 6 inches above the ground is best. Lights should be housed in a protective casing to reduce vandalism, and directed so that they illuminate the waiting and boarding areas. New York City's shelters are lighted at night by backlit advertising panels at an intensity of 20 lumens per square foot. Schedule, route information, and a map should be located in or next to bus shelters but not so that the view of the oncoming bus is blocked. Where there are large fluctuations between peak and off-peak use, a bus shelter can be designed with leaning rails, overhangs, and seating areas outside of the shelter to accommodate the differences. To be durable, bus shelters should be composed of structural members and inset panels, not snap-together "curtain walls" or decorative sections that are easily vandalized. In general, a steel structure is best. Wood is not as durable and concrete tends to be monolithic in appearance and tends to discolor and soil easily. For flexibility, installation should be by means of bolted attachment rather than by casting in place. There should be few movable parts, as they are easily broken. Parts should be easy to reorder and replace and should not require removal of other parts or sections for access to make the repair. Materials should be vandal, graffiti, weather, salt, and rust resistant, and easy to clean. A protective finish can be applied to steel in cases where salt damage is severe. Herculite glass side panels (used in New York City) resist scratching, are strong, shatter-resistant, and easy to clean. Plastic or Plexiglas is not recommended as it tends to discolor and scratch easily, reducing visibility from the shelter. The manufacturer of the bus shelter should be consulted as to the best combination of materials and finishes for a particular area. In addition to these specific issues it is also important to consider the bus shelter within the context of the overall transit system. Cooperation is necessary, therefore, between the city, the transit company, and any other parties involved in the maintenance and management of the shelter. This requires a commitment by the city to a high level of maintenance and management. There is considerable research that shows that a well-maintained bus shelter will be better respected and less subject to vandalism and other abuses than one that is poorly maintained. A good maintenance program is also contingent upon a bus shelter that is designed to minimize the amount of litter collection, cleaning, and minor repairs needed, as was described previously. A good maintenance program should include a program for monitoring the use of bus shelters once they are installed. Alternative financing mechanisms for bus shelters are becoming increasingly popular in many cities. Using private contractors to construct and maintain the shelters is one way to obtain and maintain shelters al no public cost. Private contractors typically use revenues generated by advertisements on the shelters. If this method of financing is used, it is especially important that the design, locations, and amenities that are to be provided within the shelter be specified in the contract between the city and the contractor.